my son and his girlfriend have 3 cats I needed something to bring for all of them this worked out perfectly no one had to share and every cat picked his favorite mouse to play with and no fighting. Sells crafts supplies, pet products and kids toys and games. For customer service inquiries or to initiate a return, please contact Stuff4 at support@stuff4crafts.com or 866-273-8653. Ethical Pets-Colored Plush Mice With Catnip And Rattle: Assorted. These Toys Are Designed To Appeal To Your Cat's Natural Instinct For Play And Exercise. They Are Sure To Keep Your Cat Healthy And Happy! 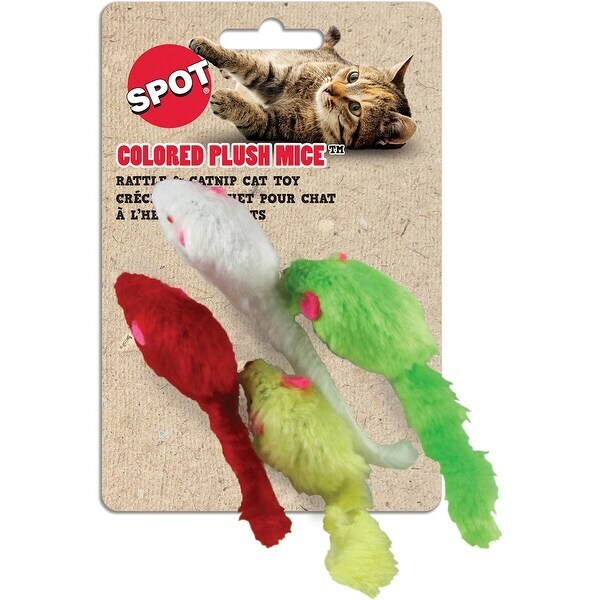 This Package Contains Four 4-1/5 Inch Long Plush Mice In Assort Ed Colors. Imported. These are crazy. Just what I wanted. I'm going to sprinkle catnip all over the living room floor on Christmas morning. Then I'll through these all around the floor. This should be funny. Being an older empty nester, it'll take away the sting of being alone. I can't wait. I'll laugh myself silly. Thanks.